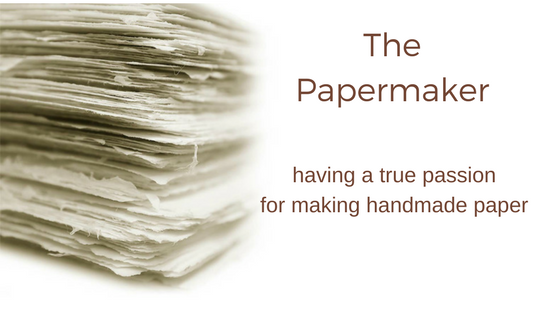 Below is a link to an inspiring story about a papermaker from Germany with a true passion for his craft. Yes, he specializes primarily in making wood-free paper, but also recycles used paper to make paper just as we do at Wooden Deckle. I love how he loves his craft, his process, and his paper! See if this video doesn't inspire you too. And watch for his "watermark" at the end of the video - so cool. ...paper can have the power of life and death..."
Last week while dabbling in Pinterest I saw a label for handmade jam that was beautifully designed, and it motivated me to rethink the labels we use for our paper making kits. A graphic artist I'm not, so it took a lot of trial and error, and printing and reprinting until my new design came together. Afterwards I gathered up the trail and error sheets, and made paper. Free Recipe, it's Earth Day! At Wooden Deckle we are all about making handmade paper by recycling paper - everyday ordinary paper made into something new - with new creative potential! Making blender paper, as it is often referred to, is as easy as tearing up no longer needed printer paper, homework assignments, etc and processing them in an ordinary kitchen blender. One of my favorite ways to make used printer paper look like rustic handmade paper is to make Green Tea Paper - enjoy this recipe from our Wooden Deckle Instruction Booklet, included with every papermaking kit. Happy Earth Day! 1. Place blended recycled paper pulp in a stainless steel bowl with green tea bags. 2. Cover with hot water, and allow to steep several hours. 3. Break open one or two of the tea bags, and mix in the loose tea. 5. Add a handful or two of the pulp to vat, along with enough water to make vat half full. Make paper as you normally would. The result is a beautiful rustic-looking creamy paper with brown flecks of tea, and a subtle green tea scent! Reminer: Use EARTHWECARE coupon code for $5.00 off of any papermaking kit this month.